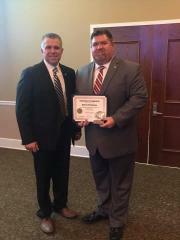 Jackson Police Investigator graduates from Leadership Jackson. 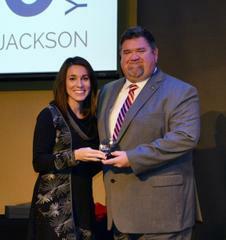 Recently, Jackson Police Investigator, Aubrey Richardson, graduated from the Jackson Chamber's 40th Leadership Jackson class at the Carl Grant Events Center at Union University. Investigator Richardson also received the "Pearl Award" for outstanding leadership qualities and going above and beyond in volunteer opportunities. Leadership Jackson is a leadership development program for community members who demonstrate leadership potential. Also, this program gives business professionals the opportunity to better understand the community and the opportunities and the challenges it faces. Class members visited community landmarks, met with area leaders and participated in weekly sessions about topics impacting Jackson-Madison County, including education, healthcare and government.